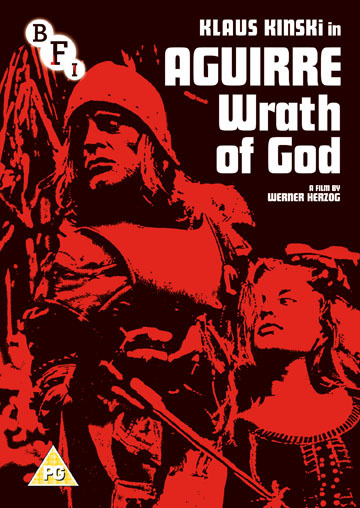 This early masterpiece from legendary German director Werner Herzog (Fitzcarraldo, Grizzly Man, Cave of Forgotten Dreams and Nosferatu the Vampyre) is available in a newly restored version. Shot entirely on location in the wild Amazonian jungle, Aguirre stars the volatile German star, and Herzog's regular, Klaus Kinski as a power-crazed explorer in sixteenth-century South America who leads a band of conquistadors through the Amazon in search of El Dorado. An ambitious exploration of doomed adventure and savage beauty, Aguirre remains one of Herzog's most extraordinary and brilliant achievements. • The Unprecedented Defence of the Fortress Deutschkreuz (1967, 15 mins): symbolic drama about four young men hiding from an imagined enemy. • Last Words (1968, 13 mins): short film about the last man to leave a former leper colony. • Fata Morgana (1971, 74 mins): hallucinatory film exploring mirages and the Mayan creation myth.